Become a Member of the Archbishop Coleman Carroll Legacy Society at our Annual Induction Ceremony each November. About Archbishop Coleman Francis Carroll (February 9, 1905 - July 26, 1977), was the first Bishop and later Archbishop of Miami, Florida. Archbishop Carroll was ordained a priest in 1930 within the Diocese of Pittsburgh. While in Pittsburgh, he served as a parish priest until 1953 and was then appointed auxiliary bishop of the diocese. On August 13, 1958, Pope Pius XII appointed Bishop Carroll the first Bishop of the newly created Diocese of Miami. He would be installed with the founding of the diocese on October 7, 1958. At this point, the Diocese of Miami included the sixteen lower counties in Florida, with a population of only 200,000. Encompassing one half of the state, he would lay the foundation that would allow the Catholic Church to grow through thousands of Cuban refugees, the American Civil Rights Movement, Vietnam and the reformations of the Second Vatican Council. He created the Catholic Service Bureau, now known as Catholic Charities, to serve as a social network that to this day rivals that of the State of Florida. In 1968, due to an increasing population, the decision was made to divide the Diocese of Miami. Miami would be made an Archdiocese by Pope Paul VI and be named Metropolitan See for all of Florida. Consequently, Coleman Carroll became an Archbishop on March 2, 1968. Less than ten years later, Archbishop Carroll took ill and died. At the time of his death, the Archdiocese of Miami had grown to encompass 700,000 Catholics within eight counties. Often referred to as the "architect" of the Archdiocese of Miami, Archbishop Coleman Carroll's has left a lasting legacy that will endure in our community for all generations to come. 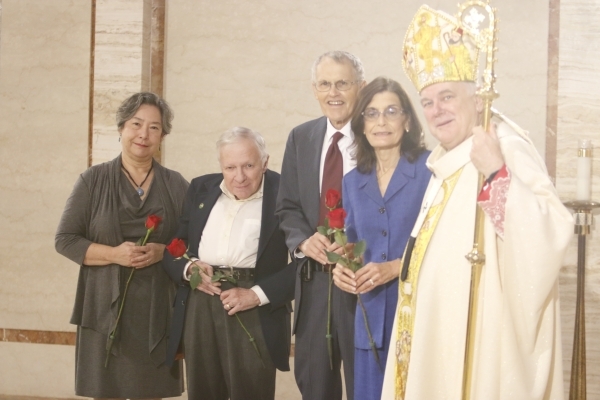 The Archbishop Coleman Carroll Legacy Society honors individuals and families who have included gift intentions for the Catholic Church in their estate plans and have notified the Office of Planned Giving in the Archdiocese of Miami, or who have made planned gifts to the Archdiocese of Miami, including any of its parishes, schools or entities. Each year Members are celebrated at an annual induction ceremony. Include a bequest to the Archdiocese of Miami or any of the 280 affiliated Archdiocesan entities (parishes, schools, ministries, etc.) in your will or trust. Create a plan that pays you income for life and then provides a gift to your parish or the Archdiocese of Miami (or any of its affiliated entities). Name the Archdiocese of Miami (or any of its affiliated entities) as a beneficiary of a life insurance policy or retirement plan. Establish a trust that provides income for the Archdiocese of Miami (or any of its affiliated entities) before passing assets along to heirs. If you have made a provision for the Church in your estate plan or wish to receive samples of language for making bequests to the Church, please contact the Office of Planned Giving at (305) 762-1110, so we may honor and thank you for your intentions. I/we would like to notify the Archdiocese of Miami of my/our gift intention.